El regreso de Perséfone. This painting was exhibited at the Royal Academy in 1891. The legendary tale of the abduction of Persephone was a favorite subject for artists through the ages. According to Greek mythology, Persephone was the beautiful daughter of the goddess Demeter. Hades, the dark god of the Underworld, became enamored with the lovely young maiden, and so one day he simply emerged from his shadowy realm and plucked Persephone from the earth like a flower. Persephone's mother Demeter was heartbroken at the loss of her daughter. As Demeter was the goddess of agriculture and fertility, she used her power to make a demand to be reunited with Persephone. In the end, that is precisely what happens - Persephone is returned to the earth and her mother for part of the year, while she spends the rest of her time with Hades. The story is therefore a mythological explanation for the changing seasons. In this painting, Lord Leighton has focused on depicting the dramatic reunion of mother and daughter. The willowy, fragile form of Persephone drifts gently toward the outstretched arms of her eager mother. Demeter, clad in vibrant orange robes, stands silhouetted against the cloudy blue sky. Along with Persephone and Demeter, one other figure is present - the god Hermes. 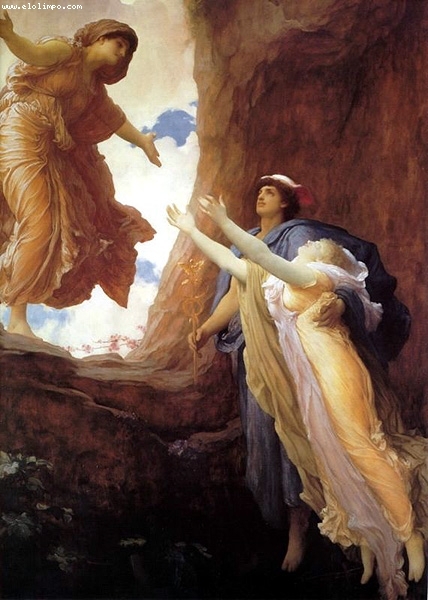 In this scene, Hermes acts as an intermediary, delivering Persephone to the surface of the earth.